Born in the Paris suburbs in 1976. At the start of the 90s Jo cut his teeth on walls and trains alongside Nestor & Lek and their TEAM VF collective. 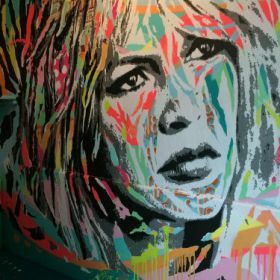 As a fervent adept of graffiti, Jo gradually moved on to create what he chose to call "pop graffiti", combining collage, various graffiti influences and the pop culture of his youth. In his work Jo pays homage to the icons and celebrities of history, producing anonymous portraits whilst always making clever references to his favourite artists. Jo Di Bona was considered amongst the "[...] 10 artists to watch out for in 2016" according to Artsper.